For those wishing to contact us, email hiddencambodia@yahoo.com. Bookings: Please email us with details include name, nationality, age, country residing in, dates and times of arrivals , no. of people, type of tour and any special interests. Deposits are 30% to 50% of tour costs and can be paid by PayPal and by bank or money transfer. Western Union and money gram are also in operation. Thanking you in advance. Cost of transfers are incurred by client. Tel: 855 12 934 412, For those phoning within Cambodia drop 855, and add 0 before 12. Siem Reap. Our base office lives up to its name - hard to find. Best thing is give us a call and we can collect you. 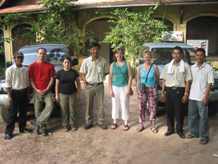 Base Office 1:House & Office .We are located off the road to Angkor Wat. Just after the Sofitel Hotel and the Children' s hospital with the large head statue, turn right on to the big road, Route 60 heading towards Spean Neak. 75 mts on the left, just after the Laskmi restaurant, take a left into a small road, next right, and we are the next yellow house on the right with all the tall trees.